Greeting New Jerusalem resident Shawine (center) and Sister Margaret McKenna, M.M.S., in the home's doorway are Kate Lerner (left), New Jerusalem board secretary and Art Lerner, board president. Not every social outreach program has a million-dollar facility with a million-dollar budget. 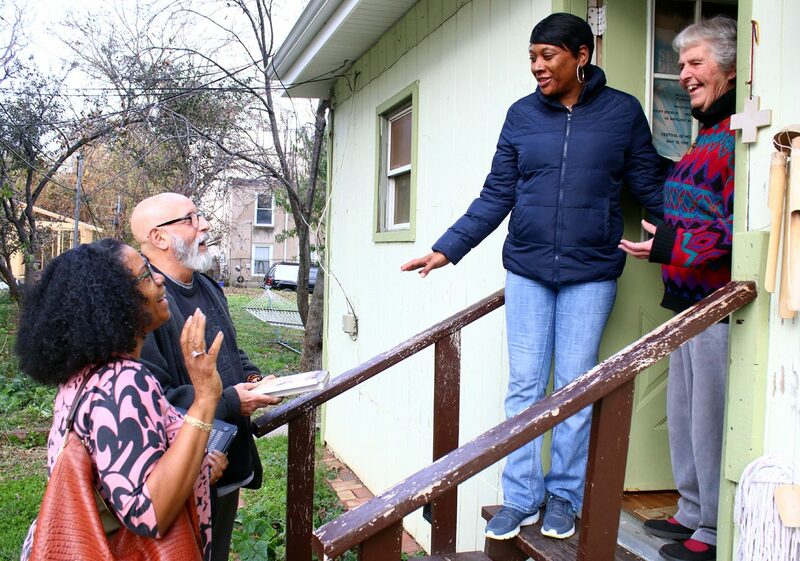 Take New Jerusalem Now, a substance abuse recovery program that operates out of a group of rehabbed houses at 20th and Norris Streets in North Philadelphia, one of the poorest areas of the city. What it lacks in funding it makes up in mission-centered idealism and has been doing so for almost three decades. It is a beacon of hope in a field in which recent news reports suggest some rehab facilities may be operated by individuals more interested in exploiting persons with addictions than in assisting them. While New Jerusalem Now is non-denominational in staff and clients, it comes out of the Catholic social teaching practiced by Medical Mission Sister Margaret McKenna, a founder who is assisted by Medical Mission Sisters Barbara Brigham and Maria Hornung among mostly volunteers. “Devon,” a young man who has lived at New Jerusalem for the past 16 months, admits he was running the streets, abusing drugs and stealing to support his habit, before a friend who was in recovery told him about the sisters’ program. He was skeptical, believing those places didn’t really work. He decided to give it a shot anyway. Now having completed a course as a care specialist and almost ready to leave, he hopes to find work helping others at a shelter. Sister Margaret founded New Jerusalem Now along with Richard Withers, a Catholic convert who has since become a canonically recognized dedicated hermit. 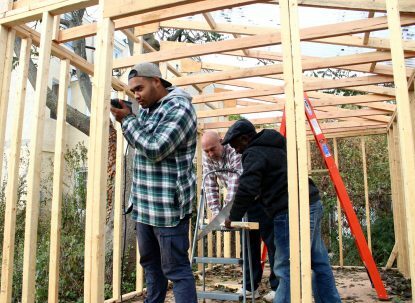 Eric Frankhouser (center), spiritual director at New Jerusalem, helps residents build a greenhouse shed. Sister Margaret’s life as a religious began when she joined the Medical Mission Sisters at age 18. Early in her religious life she was active in the 1960s’ anti-war movement with Philip Berrigan, which earned her a four-month retreat (jail time) at the expense of the federal government. She also felt a calling to the contemplative life and she spent seven years in Israel, part of the time at a contemplative monastery and often seeking the solitude of the desert. This did not work out permanently. After returning home it did suggest the name for the shelter she and Withers founded. Jerusalem is a city near a desert, but not all deserts are sand, she reasoned. The harsh environment of North Philadelphia was indeed a desert so her new venture would be New Jerusalem Now, as it should be in God’s eyes. It helps that she and the other sisters have vows of poverty. They do get small grants from the congregation and other sources. Through this, along with the residents chipping in from their meager funds, they get by. It is not easy work. While there are success stories there is also recidivism. “More than half make it,” Sister Margaret said. As for the rest, “we see them (again) in five to seven years on average,” she estimated. “Jane” is an example. Her healthy appearance belies her two-decade struggle with drugs. While Jane is at New Jerusalem she lives in the women’s residence, another house on the same street, as are the two other houses for men. What New Jerusalem does would be impossible without dedicated volunteers. That would include Dr. Arthur Lerner and his wife, Kate. He is vice chairman of the board and she is a board member. Dr. Lerner first met Sister Margaret on a Peace Walk, and although his specialty is with kidney diseases he started to come to treat the residents. Kate Lerner thinks New Jerusalem is as effective as it can be, because to be healed a person has to want to be healed. “It is necessary. It is a place where people can go without being looked down upon or judged,” she said. Sister Maria, who is in her fourth year at New Jerusalem, is really coming off a half-century mission working as a nurse midwife in Pakistan where she also trained local midwives in a country with few female doctors and a tradition that men should not treat women. Although technically home in the United States for retirement, she too feels New Jerusalem is an exciting and needed ministry. Nothing tells the story better than success. Gary Robbins is no child, but could easily be a poster child for New Jerusalem. In 1999 he was in detox on a suicide mission. He didn’t even know his own name. Life was horrible, and he’d lost two sons to murder. It was his mother who picked him up and brought him to New Jerusalem. Back then it was mostly Sister Margaret and Sister Sheila Flynn, a Sister of the Assumption, who helped him. After his recovery Robbins showed his gratitude by coming back as a volunteer, and eventually was asked to join the staff. As a former drug addict he knows what the men and women coming into the program are going through. It is a prayer that New Jerusalem, with dedicated sisters and staff, will continue for many, many years so that other Garys, Janes and Devons will also be healed for the generation of children and grandchildren to come. To assist New Jerusalem Now write to New Jerusalem Now, 2011 West Norris Street, Philadelphia, PA 19121 or call 215-763-8806. 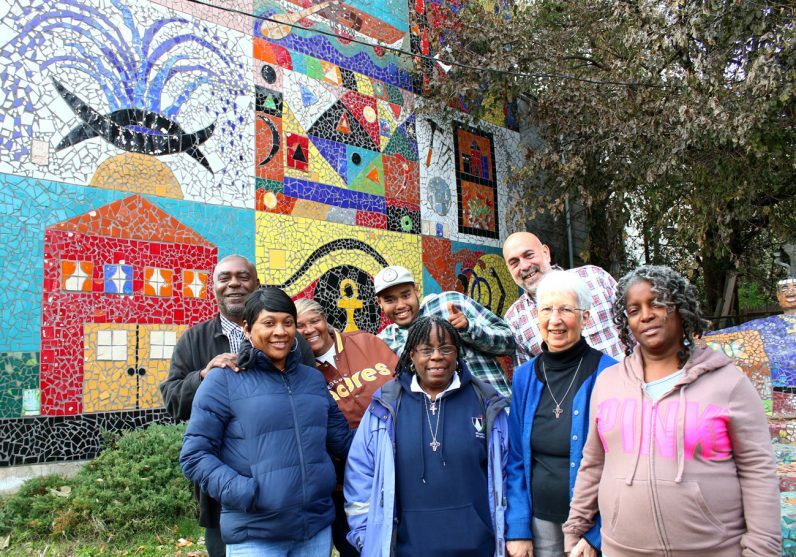 Residents, Medical Mission Sisters and volunteers stands in front of a mural that was created by the New Jerusalem Now community. The link to New Jerusalem in the article does not work. The link worked, but it was to a website not affiliated with New Jerusalem Now, which does not appear to have a website of its own. Thank you for pointing out this issue.